Coyote Wins a News & Documentary Emmy! There is a fascinating story as to how Peter found out in 1999 that he had actually won an Emmy seven years before! When this web site began to take shape in 1998, Peter put his webmistress in touch with retired and recently widowed Roberta Teska of Florida. He thought that she would enjoy helping as she was a fountain of knowledge when it came to his career. In order to enjoy this new web site, Roberta decided to buy herself a computer and to take some basic lessons. It wasn't long before she was surfing the Net. In early 1999, she came upon a most interesting discovery. She visited the web site of the National Academy of Television Arts & Sciences and entered Peter's name into their database. His name came up as winner back in 1992! At first it didn't seem possible that he wouldn't have known about it. Was it just an error? 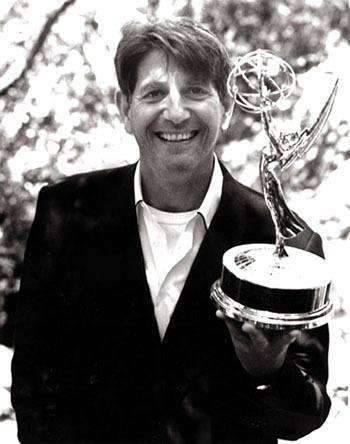 Roberta pursued this with her usual dedication and after she contacted the National Academy, Peter received a call on March 9 telling him that he had indeed won a News and Documentary Award in 1992 for his narration of "The Meiji Revolution," one of the ten episodes of the Pacific Century series shown on PBS. Why he was never notified will remain a mystery, but at least he's been recognized and awarded for the rich quality he brings to all his narrations and many thanks go to Roberta!